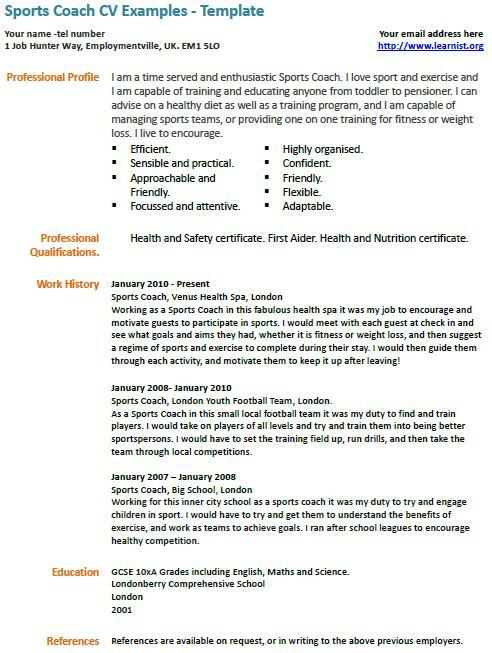 Sports Coach CV Examples – Template. You can amend this CV example as suitable and write your own CV in minutes. I am a time served and enthusiastic Sports Coach. I love sport and exercise and I am capable of training and educating anyone from toddler to pensioner. I can advise on a healthy diet as well as a training program, and I am capable of managing sports teams, or providing one on one training for fitness or weight loss. I live to encourage. Health and Safety certificate. First Aider. Health and Nutrition certificate. Working as a Sports Coach in this fabulous health spa it was my job to encourage and motivate guests to participate in sports. I would meet with each guest at check in and see what goals and aims they had, whether it is fitness or weight loss, and then suggest a regime of sports and exercise to complete during their stay. I would then guide them through each activity, and motivate them to keep it up after leaving! Sports Coach, London Youth Football Team, London. As a Sports Coach in this small local football team it was my duty to find and train players. I would take on players of all levels and try and train them into being better sportspersons. I would have to set the training field up, run drills, and then take the team through local competitions. Working for this inner city school as a sports coach it was my duty to try and engage children in sport. I would have to try and get them to understand the benefits of exercise, and work as teams to achieve goals. I ran after school leagues to encourage healthy competition.